Most known are the azulejos in blue and white but the first glazed tiles which appeared in Spain in the 13th century where mainly green, brown, and yellow. They were not only used to cover walls as an ornamental form of art, but had the capacity of temperature control in homes. Many azulejos chronicle major historical aspects of Portugese history. The styles are following their times. In the 13 th century the Spanish city of Sevilla became the center of Hispano-Moresque tile industry. The earliest azulejos were alicatados, panels of tile-mosaic. Tiles were glazed in a single colour, cut into geometric shapes, and assembled to form geometric patterns. In the 16th century the Portugese adopted the Moorish tradition of 'horror vacul', fear of the empty spaces, and covered the walls completely with azulejos. King Manuel I was introducing new techniques after a visit to Sevilla in 1503. Many examples can been seen in Sintra National Palace. In the early 16th century potters from Italy came to Sevilla and established workshops there. They brought with them the maiolica techniques, allowing the artist to represent a larger number of figurative themes in their composition. The late 17th and early 18th century became the 'Golden Age for the Azulejo'> Mass production was started not just of a greater internal demand, but also because large orders came in from the Portugese colony of Brazil. Large one-off orders were replaced by the less expensive use of repetitive tile patterns. At the end of the 19th century, factories in Lisbon started to use another type of transfert-printing: using creamware blanks. While these industrialised methods produced simple, stylised designs, the art of hand-painting was not dead. Using some antique azulejos as a background for a bathroom. 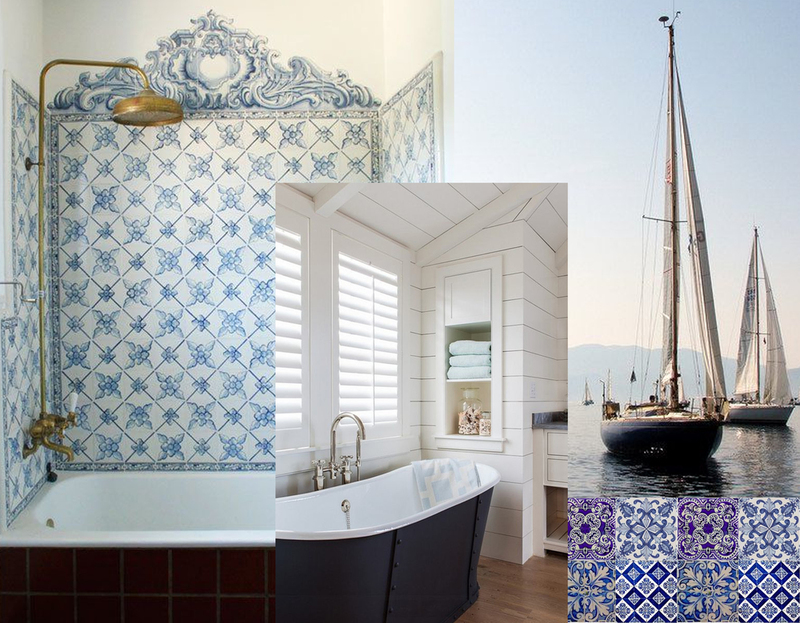 In combination with some brass or copper faucets the blue and white tiles will give your bathroom a luxurious feeling. The cast iron free standing bathtub will bring the final touch for this nautical inspired bathroom. 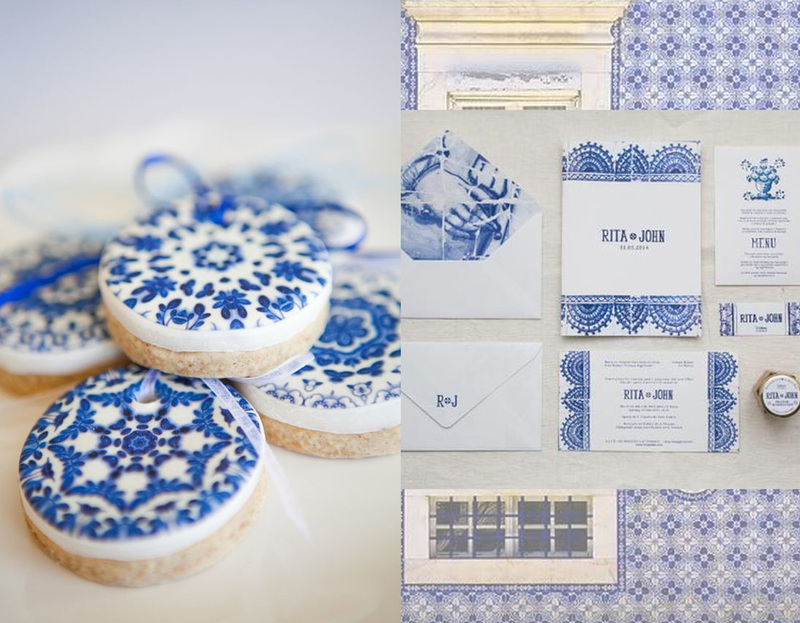 Azulejos are around since centuries but they continue inspiring different companies. Having a wall with a bleu and white wallpaper is easier to install than tiles. A classical motif gets a modern look when combined with some metal chairs, a rustic wooden table and some modern metal lamps. I would go for this combination when decorating a sea side house. Young Portuguese designers are giving the azulejos a new boost by using it to decorate very modern furniture. Azulejos are not only a source of inspiration for the furniture designers; Christian Lacroix made a very flamboyant mural with this theme for Designers Guild. Dolce & Gabbana printed some of their fabrics with those motifs for their collection winter 2016. And it can be a starting point even for some smaller objects, such an elegant stationery, wedding invitation or even for cookies. Azulejos are around since centuries but they are so much of today. When you will use them in your house you can be sure they it is not just a fashion trend which you want to change in 3 years, it is a perfect background.